Augusta is a consolidated city-county located along the Savannah River and the central eastern border of Georgia. Around 197,166 residents live in this region. The town is home for Masters Golf Tournament, thriving culinary scene, outdoors activities and artwork. Augusta, GA has become a destination for senior citizens who want low cost of living and warm weather. Augusta was ranked at number 63 as the best place to retire and position 76 as the ideal place to live by the US News. The research group was looking for the right areas to live based on the job market, the value of living, and quality of life. It evaluated 125 metro regions in the United States during the survey. Augusta is part of the Richmond County School System with 36 elementary schools, nine high schools, and ten middle schools. The eleven private schools available serve the local community. 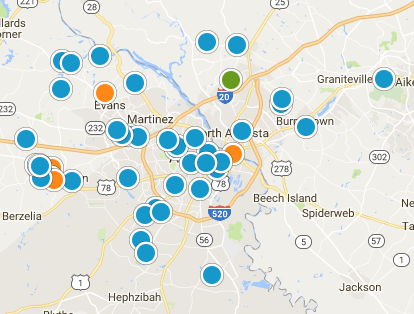 Augusta residents have four magnet schools from which to choose. Augusta attracts retirees, families, and students. Residents under 20 years make up more than a quarter of the total population, and 14 percent are senior citizens. It is also home to around 20,000 veterans since the Fort Gordon military base is located in the area. Residents have freedom of worship, and there are churches, mosques, and temples for various religious groups. The cost of living in Augusta is cheaper than the national average. It varies with neighborhoods. The living costs draw families, retirees, and college students who wish to live a decent life without paying a high cost for housing. Most of the Augusta residents use their cars to move around. Augusta Public Transit has nine a rural transit service and fixed bus routes. Riverwalk pavement is pedestrian-friendly. The regional airport offers services to Charlotte and Atlanta via American Airlines and Delta Air Lines. Augusta is best known for its golf tournaments. Sunday jazz concerts and Saturday farmers markets take place between May and August along the river. The Augusta Riverwalk has two parallel walkways. Residents visit Clarks Hill Lake and Phinizy Swamp Nature Park to enjoy the nature. President Woodrow Wilson's home and Confederate soldiers' grave are destinations for history buffs.